As well as eating Termidor, a termite will also unknowingly pick it up and carry it back to the colony on its body. 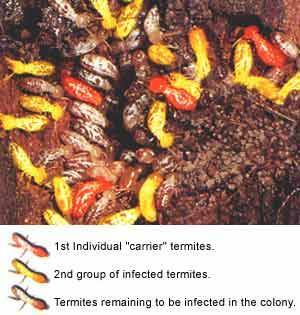 So every termite it contacts, feeds, or grooms will itself become a carrier, contacting and "infecting" others. This combination of ingestion, contact, and the "Transfer Effect" results in unparalleled efficacy. Eight-plus years of test data show Termidor provides 100% control. And Termidor delivers results in 3 months or less. That's 2 to 6 times faster than a bait/monitoring system. Many termite bait/monitoring systems work by recruitment, which means termites eat the bait and return to the colony to recruit others to eat the bait. However, this process cannot begin until activity is identified in a monitoring station. Bait/ monitoring systems can take months to years to control a colony. Termidor provides 100% control in three months or less. To learn more about how Termidor compares to bait/monitoring systems - some of which use recruitment to control termites - consult the easy-to-follow pictorial guide below. Termidor is applied using traditional, time-tested techniques that Pest Management Professionals are very knowledgeable and familiar with. The Termidor in the treated zones starts working immediately. Termidor is a non-repellant so termites can’t smell, see, or feel it as they forage freely in the treated zone. The bait/monitoring system is still waiting for the foraging termites, No activity is observed in the station so no active ingredient is added. Termidor allows the termites to continue their activity and remain active long enough to transfer Termidor through mere contact with each other before they die. With monitoring there’s no transfer of active ingredient from one termite to another. Baits are effective only through ingestion, which can’t begin until activity is found and the active ingredient added. A few worker termites are present in the monitoring station, but not enough to add the active ingredient just yet. Success. The termite populations have been controlled in 3 months or less with Termidor. Finally, there are enough worker termites (at least 40) for the active ingredient to be added. Eventually the termites will eat the bait and recruit other termites to eat it.